I was about eight or nine years old when Dad said he thought I was ready for some long walks. ‘Ooh, good,’ thought I, and Mum confirmed that going out with Dad for a full day’s hiking would be part of my growing up. I felt pleased to be considered ready for promotion, whereas Mary wasn’t yet judged strong enough, and anyway she was a girl. Nevertheless the prospect made me apprehensive, because Dad had made it clear that we’d go only when he believed I could make the grade. I started to wonder if I’d be able to do it. Dad was the kindest of men, but not one to tolerate a wimp. He would put me to the test, and I’d have to prove myself. I resolved not to let him down. Our first excursion started with a three-mile bus ride to Bramhope, which is on the main road to Leeds. This gave me as much concern as the subsequent walk, because I suffered dreadfully from travel sickness. But we had to start at Bramhope, because our first objective was Arthington Staircase, which Dad described as an amazingly steep track down the valley side, so precipitous that people said it should have been made into a flight of steps. Dad had walked or cycled the track many years before, and from his description I’d formed the impression that we might struggle to make it safely down. Should we take a rope? Would I be up to the challenge? Wondering what the outcome would be, I followed him onto Samuel Ledgard’s blue boneshaker bus. At Bramhope we cast around for the Staircase. Dad seemed oddly uncertain of our whereabouts, and I felt somewhat miffed: this wasn’t how adventures were supposed to start. An enquiry of a passer-by didn’t help, so further quartering of the ground was needed, then a further inconclusive query, but suddenly he shouted that he’d found the route, and we were away along a metalled road. We turned off and plunged down a loose chute of soil and gravel, where exposed tree roots tried to trip us and overhanging branches shut out the daylight, but we emerged quite quickly into the sun and open air after a brief and underwhelming experience. I muttered something in reply but couldn’t feel excited. It hadn’t compared to the running, jumping and tumbling we performed each week on The Chevin, but he seemed happy that we were on track, and we strode along side by side towards Arthington and Pool-in-Wharfedale. We stopped for sandwiches and a flask of tea, finally walking home past Caley Hall and through the Irish Fields. The hike had been no trouble at all. I’d passed the first test. A few weeks later we set off on our first full day’s walk. As we strode through Otley no one would have guessed that we were embarked on something out of the ordinary. Specialised hiking gear hadn’t reached the wardrobes of the average family, so Dad sported his tweed jacket and carried his raincoat, while I wore the zipped windcheater in which I walked to school. On our feet were our only leather shoes, which we would have to wear again on Monday. The one material clue that we were on serious business was the Home Guard ammunition bag that held our lunch. We crossed the river, passed through Wharfemeadows Park and strode up the tarmac lane towards the village of Farnley. This was new ground to me, though I’d seen it at a distance from the slopes of the Chevin, which were now receding across the valley. On our left were hawthorn hedges and pastures, to our right a high stone wall and tall trees. Dad told me that hidden in the trees were the Nissen huts of a wartime army camp that now housed National Service men, and that beyond them stood Farnley Hall, home to the Horton Fawkes family, who had donated some of the land for Wharfemeadows Park and also given much of the Chevin to the people of Otley. The sun warmed us as we laboured steadily up the hill, but the gradient was gentler than our regular route up East Chevin Road, and Dad had plenty of breath to regale me with tales from his youth. In the nineteen-thirties, he recounted, when he and Mum were courting, she used to play the piano for Farnley Concert Party and had to make her way up this very lane for evening practice. He worked all day and then cycled ten miles to night school in Leeds, but afterwards he rode back via Farnley and accompanied Mum home under the stars. It sounded like hard work to me. He went on to tell me a less romantic tale of his own parents. Granddad Stott was a thin man, while Granny Stott was very generously proportioned. They took a walk similar to the one we were engaged upon. The day warmed up, and Granny grew hot and thirsty. Imagining a cool glass of ale, Granny walked on, but she was mortified to find the Black Lion was nothing more than a cast-iron drinking fountain. Granddad laughed and told her the water would keep her going until they reached the Queen’s Head at Farnley, where she would be able to slake her thirst. Granny struggled up the long hill, perspiring and panting, to find Granddad chuckling to himself as he leaned against the Queen’s Head. It was another drinking fountain, built into the wall at the entrance to Farnley Hall. Granny reprimanded him severely, but Granddad just laughed, and luckily the rest of their walk was downhill to Otley, where refreshment opportunities were diverse and plentiful. Dad showed me the Queen’s Head and the gates to the Hall, and then we backtracked to a signposted path that led us through fields of sheep and lambs to the little church on the ridge. We sat on a stone stile, and he gave me a Polo mint while he smoked half a cigarette. The dew had soaked our toecaps, but the sun warmed us while a sly breeze cooled the sweat on my back. ‘How are you doing?’ Dad asked. I was determined to soldier on, come what may. Looking back more than fifty years later, I think the size of the challenge and my need to be resolute had been somewhat overstated. We joined the northbound road that cuts across the slope and descends into the narrow Washburn valley, of which I’d heard so much. Tall conifers and stonewalled pastures clothed its steep sides. Here and there a farm clung to the hill. There was no town, no village, not a single factory chimney. How different it was from Wharfedale and from smoky Airedale. ‘Can you see the reservoir?’ Dad asked. Eagerly I peered over the wall towards the valley bottom, but I couldn’t see it. I still couldn’t see it. Sure enough, I soon distinguished the long narrow band of water, reflecting the dark needles of the plantation. As we dropped further down the hill the sense of enclosure increased, and I really felt I was in a new place. Strange to relate, I also began to feel more confident that I’d complete the walk. Our road crossed the reservoir on an embankment. I climbed onto the stone parapets at each side to stare at the huge expanse of water, held captive by a distant dam. We turned onto a broad and sunlit track between the steep hillside and the iron railings that bordered the reservoir, and Dad announced that it was lunch time. We sat on his raincoat under the larch trees and ate our sandwiches. He poured tea from the flask into small metal cups, but I preferred water from the glass bottle and left his precious tea to him. He re-lit his half cigarette, and the lightest of breezes swirled the smoke around us and away. Water birds cried sporadically, and we identified a great crested grebe, worth forty points in the I-Spy Birds Book. A solitary vehicle changed down through the gears as it ground its way up the one in six gradient of Norwood Edge, punctuating the peace that preceded and followed it, and I got to my feet and disturbed the tranquillity by throwing pebbles into the water. We walked along towards the dam. ‘Is it what you expected?’ Dad asked, nodding towards the structure. ‘I don’t know, really. It’s not like the pictures in the encyclopaedia,’ I said, thinking of the Elan Valley reservoirs. I remember feeling that Leeds, a dirty city, had no right to take water from such a wonderful valley, but then I realised that it was the dams that made this landscape so extraordinary to me. Dad casually tossed another gem into the conversation. That really amazed me. It sounded like something out of an adventure story. ‘Can we go there next time?’ I asked eagerly. He smiled down at me and said it was a long way, but maybe one day we could do it on bikes. The only snag was that neither of us had a bike. By now we’d passed the dam and its spillway and were descending gradually through mixed woodland towards a narrow road. I wondered how people found out about short cuts. We crossed the road to a flight of steps which took us down into a long grass field. An obvious path led straight on. To its right, the field fell gently to the tree-lined course of the Washburn. On the left, a ditch with crumbling masonry sides channelled a sparkling stream parallel with the path, and beyond the stream the field rose steeply, with clumps of hawthorn and bramble scattered about the slope. ‘This is called Trout Beck,’ Dad announced, pointing to the stream, and straight away I could see why. Trout lazed in the shallow flow, motionless apart from the rhythmic wave of their tails and the slow movements of mouth and gills. This was amazing. I’d never seen anything like it, yet here we were, only a short cut from home. There was more to come. As we neared the end of the field I heard a rumbling groan, and where the path curved behind a large clump of bushes and trees I saw that the stream flowed through vertical iron bars and disappeared into a dark hole in the wall of a building. Dad led the way round the side of the building where the noise was loudest and gestured towards an unframed window space. In some trepidation I approached the dark orifice, feeling the ground tremble. Water splashed noisily, the grumbles and grindings grew louder, and when I looked into the dimly lit space I saw a huge wheel turning, and I felt the spray on my face. I thought I was rather brave, daring to stick my head inside. Dad explained how the water turned the wheel and the wheel turned a shaft which turned a bevelled gear which meshed with another gear on another shaft which turned the millstones to grind the grain, but I think my ability to absorb new concepts was already exhausted for the day. He looked pleased at having shown me something new, and I felt pleased too, because it was exciting and because he’d shared it with me. He was a perceptive educator: he sensed which things interested me and rarely pushed those that didn’t. He could be very brisk and businesslike, treating me as a young male who needed to learn from an old one, and at those times he expected me to concentrate, to straighten my back, and to behave in a mature manner. We walked a long half-mile on the road to the tiny village of Leathley, where I longed for a drink, much as Granny had done several decades earlier. Sadly, our water bottle and flask were empty. The Black Lion yielded nothing, so we faced a dry walk, and the irony that the big water main had burst there a few weeks earlier and flooded the road only exacerbated my thirst. By this time I was feeling tired, but one of the great features of the walk was that all the hard climbing had been done in the first hour. As we rounded the spur that separates Washburn and Wharfe, the Chevin came clearly into view, showing us the way home. As we walked up the broad valley, my calves complained silently and I had to dig deep to keep going, but Dad had grown relaxed and sang a tiddly-pom song, knowing we’d almost completed our venture. Soon we were retracing our steps through Wharfemeadows Park, and never before had home seemed such a refreshing place, where Mum lavished praise on me and Dad said I’d done well. How did we follow that? In truth I can’t recall what we did. Three grandparents died in 1955-1956, and Mum hit a low spot. By the time we got going again, Mary was judged old enough to do the walk round Lindley Reservoir and Trout Beck and thus became an honorary boy. On occasions we were joined by our cousin Ian and some of my school friends, including Robert Ledger, Michael Hardy and Peter Hopper. Dad took on a range of duties and responsibilities, including route finding, entertainment, blister repair and crowd control, seamlessly combining the attributes of the Pied Piper, Roald Dahl, Doctor Kildare and Dixon of Dock Green. I guess we made two or three forays along the same route under his direction. We usually stopped to play at Trout Beck, where Robert in his mock leopard skin trunks learned to swim, as well as adapting the waxed paper of his frozen Jubbly packet for use as a water squirter. Around that time, I joined the Scouts, and Dad was no longer needed for hiking expeditions, but the deserted village of West End still haunted my mind, and that would require bikes. Some of those who feature in this narrative appear on this photograph. Back Row: Tom Creak, Richard Harrison, David Moxon, Andrew Soper, Peter Stott, Peter Hopper, Roderick Hannam, David Veall, Robert Hall*, Alan Marston. 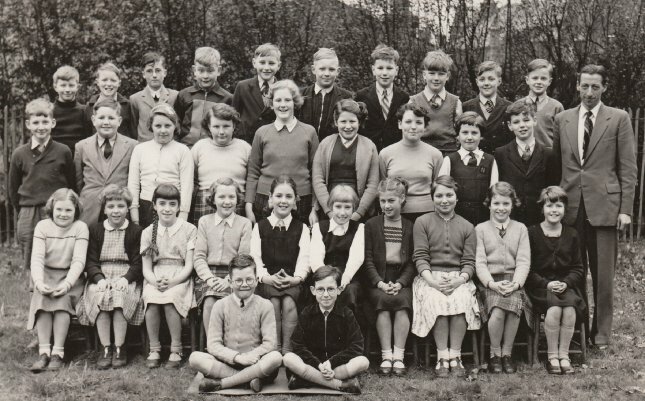 Second Row: Rodney Howard, Michael Hardy, Margaret Bird, Lucy Atkinson, Georgina Smith, Noreen Hopkins, Ann Holmes, Lynne Jackson, Paul Woods. First Row: Lynne Rookledge, unknown, Margaret Atkin, Hilary Wood, Jennifer Davies, Jane Sharp, Jennifer Lee, Brenda Dykes, Denise Parkington, Patricia Benson.